If you are over in the good old US of A and own the Samsung Epic 4G Touch on Sprint, you have probably been patiently waiting for the Android ice Cream Sandwich update to get rolled out to your device, it appears that you should gain the Android Ice update over the next few days. 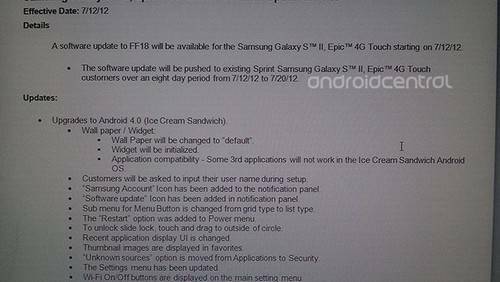 According to the guys over at Android Central, they were given a screen shot (image below) that reveals that the Android Ice Cream Sandwich update for the Sprint Samsung Epic 4G Touch begins rolling out as of the 7th of this month and will continue to roll out up until the 20th. If you have already been playing nice along with any version of Android Ice Cream Sandwich you’ll know what the update offers, but if not the ICS update doesn’t bring too many user interface changes other than settings now being rearranged. Other stuff included a ‘Software update’ icon has been added to the notifications panel, as has a ‘Samsung Account’ icon, the sub menu for Menu Button is now changed to list type from grid type, the recent application display UI is changed, thumbnail images are displayed in favourites, the ‘Unknown sources’ option has been moved to Security from Applications, and WiFi On/Off buttons are now displayed on the main setting menu. However, according to the guys, Samsung and Sprint don’t really have a good track record when it comes to updating their devices, and as neither has actually confirmed the roll out of the Ice Cream Sandwich update you need to remain a little cautious, but keep your eye open for that update to arrive. Any of our Sprint Epic 4G Touch owning readers gained the Android Ice Cream Sandwich update for their device yet? Did you even read that image?Â It says the update would start on the 12th, not the 7th. Good job reviewing this post. chill dude. minor mistake, no harm done.